Ah, the breakfast burrito. When I used to work in downtown Portland, I was a connoisseur of the food cart breakfast burrito. Of course, buying flour tortillas at the grocery store, we don’t get those huge tortillas for those huge burritos. A home cook making a burrito is just going to have to focus on the filling, not the wrapping. This filling is powered by the magic of bacon. Take two slices of bacon and cut into fourths. Start frying the bacon on medium heat. Cut a slice of yellow onion and chop it up, making about 1 TBSP of chopped onion and add to the bacon as soon as there’s a bit of grease cooked out. Let cook until nearly done and drain, leaving just a bit of bacon grease to cook the kale. Meanwhile, on a large, ungreased pan or griddle, lay down your burrito and spread some about 1 oz of shredded pepper jack chease on it. Let cook on low so the cheese begins to melt. While the bacon is cooking, clean and chop up on leaf of kale, removing the rib. Chop as fine as you can. I like to roll the leaf up like a cigarette and then chiffonade the kale and then chop the thin ribbons of kale. Add the kale to the bacon and cook for about three minutes, until it just starts to get tender. Add one or two eggs, depending on your preference and scramble in. 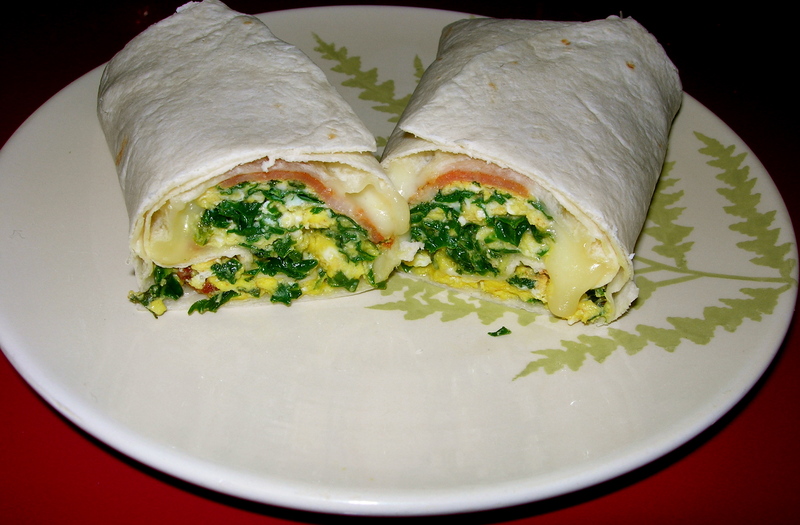 By the time your eggs are done, the cheese should have melted so you can wrap up your burrito. For me, I spread the stuffing closer to one side, roll up that one side and then tuck in the edges and roll the rest of the way, but I am no expert at rolling a burrito. I love the earthiness that the kale adds and of course, everything tastes better with bacon. Clean and slice the mushrooms. Put your soup pot on a low medium heat (2 out of 10 on my electric range) and dry cook the mushrooms for about 10 minutes. This will bring out much richer flavor and keep the mushrooms from absorbing too much liquid and getting mushy. Add 2 TBSP of butter and 2 cups of onions and continue cooking on low heat so the onions sweat, enriching the flavor. Add the dill weed, paprika and tamari sauce and let cook for a minute or two to release their flavors before adding the 2 cups of water. Cover and bring the heat up to about 4 of 10 on the stove, a low-medium heat. Let simmer for about 10 minutes. While the mushrooms are simmering, in a separate pan melt 2 TBSP of butter. Add 3 TBSP flour and mix into a roux and cook. Raw flour is yucky. It will get a rich golden brown. Add the milk and cook for a few more minutes. (I mix up nonfat dry milk for my cup of milk since I use too little milk to buy fresh.) Add to the mushrooms, stir in and cover and simmer about 10 more minutes. Add the lemon juice, chopped parsley, sour cream, dill weed and pepper. You can serve garnished with parsley or a dollop of sour cream or both. I cleaned and chopped 3 leaves of kale, removing the ribs by folding the leaf in half and running my knife down the edge of the rib. Chopping the kale, I added 1 tsp of walnut oil, 1 tsp of kosher salt and 1 minced clove of garlic. I massaged the oil, salt and garlic thoroughly into the kale, softening it up. I then opened a can of chickpeas, straining and rinsing them thoroughly. I added 1/4 of the chickpeas to the salad and stores the rest in a container in the fridge. I chopped 1/3 carrot into small pieces and added 2 TBSP of feta cheese. Mixing it all together, I added about 2 tsps of balsamic vinegar. This made a single bowl of salad. 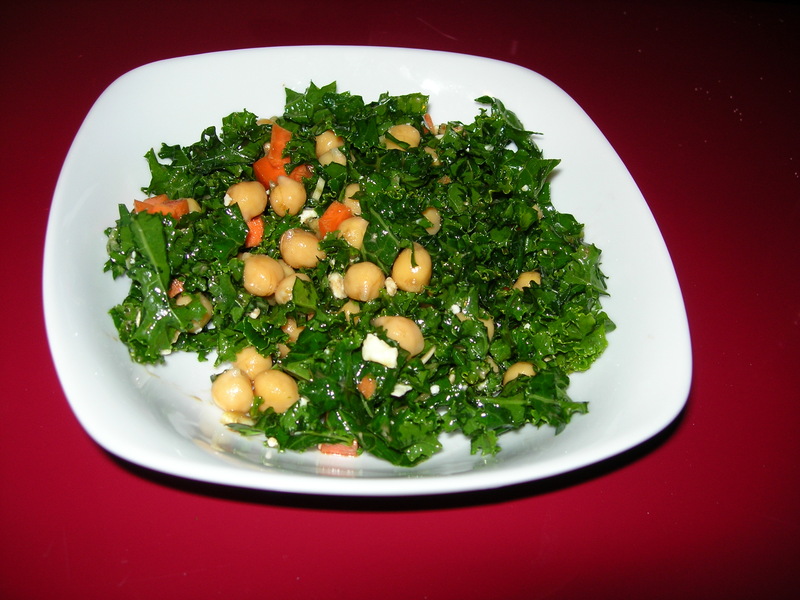 The kale is a sturdy enough salad green that the chickpeas won’t completely dominate the salad. It’s nice and garlicky and the balsamic adds a bit of sweet richness. I think it would be great with the juice of half a lemon, too. Another ten minute salad, more or less, that is delicious and lovely to look at. Cut about 6 to 8 almonds in half and toast them in a dry skillet on medium high. With luck, you will be done with the rest of the salad by the time they are toasted in 8 minutes or so. Supreme a grapefruit and reserve half the segments for use another time since you will only use half the grapefruit. Using your knife sweep the juice on your cutting board into a bowl. That’s about as much citrus as you need for the dressing. Clean and remove the ribs from 4 leaves of kale and slice thinly before chopping into small pieces. Add to the bowl with 1 tsp of walnut oil and about 1/2 tsp of kosher salt. Massage thoroughly. You really don’t need much oil since you are working it through the kale to soften every piece. When it is softened, place the grapefruit segments on top. The almonds are probably done, just tip them from the pan onto the top of the salad. Add a few slivers of parmesan on top, some fresh ground pepper and you’re done. Sometimes I think you could put toasted almonds and parmesan on a 2 by 4 and it would taste good. 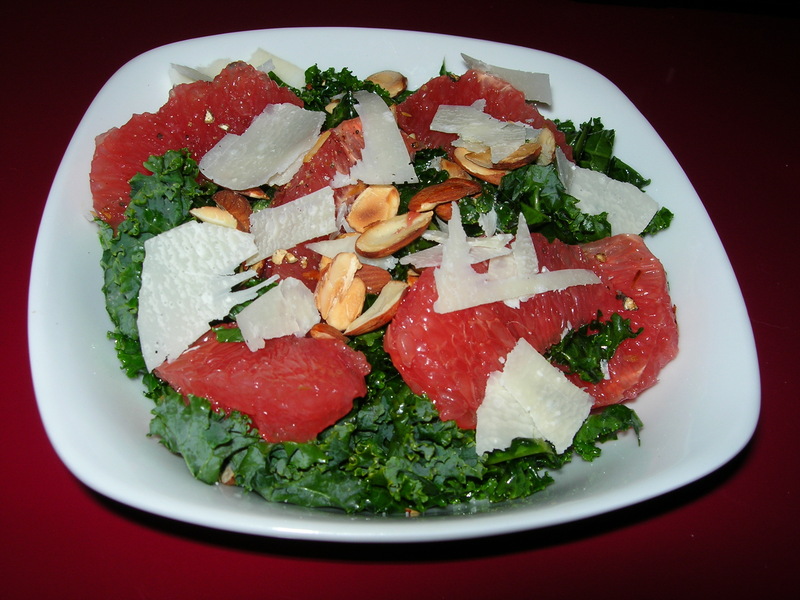 But with fresh, hearty kale and juicy, sweet-tart grapefruit, it’s heavenly. Who knew chicken and rice soup could be so flavorful? I cooked a chicken last week, making a chicken vegetable soup and reserving about 10 cups of chicken broth for other soups and dishes and lots of chicken for sandwiches and salads. This recipe takes 4 cups of broth and makes 4 servings. You can cook the rice in the chicken broth if you like. I had made my rice in advance. Heat 4 cups of chicken broth to a simmer. If you are cooking your rice in the broth,this will take about 20 minutes. In a separate bowl, whisk 3 eggs and 4 TBSP of lemon juice. I whisk the eggs until they are a light yellow, but am not trying to whip them or make them stiff in the least. When the broth is simmering, ladle some broth into the egg mixture and whisk it in. I ladled about three ladles full of broth, whisking each one in, before transferring it all back to the kettle of broth and letting it cook for a few minutes until the eggs were cooked. Add some salt and pepper. Do not just pour the egg mix into the broth because it will curdle and be lumpy and not look like what you want. It will still taste good, but you want it to look and taste good. You want the egg mixture and the broth to be the same temperature to keep it from curdling. Let it cook, stirring for two minutes or so and the soup will thicken. You can put a spoonful of pre-cooked rice in the bottom of the bowl when you serve and the soup will heat it thoroughly without cooking it any more. You can also add shredded chicken if you have any left, but it’s really not necessary. 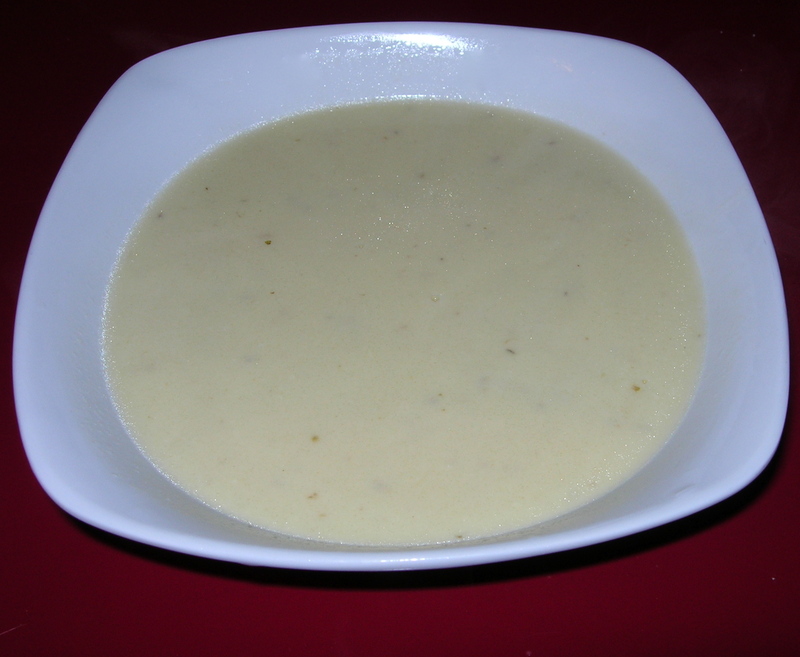 The soup is rich, creamy and delicious and does not need any additional meat. I usually prepare rice in advance. I like to cook two cups of rice at a time and keep it in the fridge to add to bacon and eggs for breakfast or to mix into a burrito or to add to some veggies. To make rice, I thoroughly rinse two cups of rice. I put the rice in a strainer and run water through it in the sink until the water runs clear. I put it in a kettle with a tight fitting lid. I add 1 tsp of salt and 3 cups of water. I learned to like firmer rice from my Malay friends in college. Most Americans like a softer rice and should use 4 cups of water. Depending on your preference, anywhere from 3 to 4 cups of rice will work. Put on the stove on high and bring to a rolling boil. put the lid on solidly and remove from the heat and let it rest 15 minutes or more. When you remove the lid, it will be done. It will not overcook if you leave the lid on too long because there’s no more water for it to absorb. Stir it to loft the individual pieces of rice before storing in a covered container. 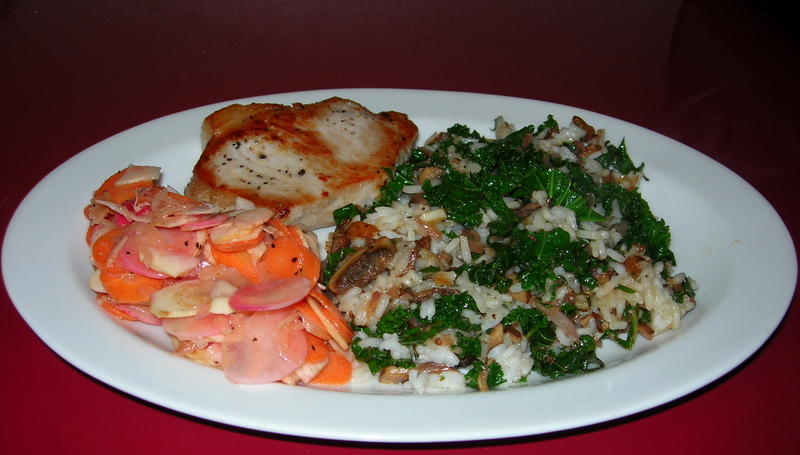 Now you have rice, you can cook the mushroom – kale concoction. Heat 1/2 TBSP olive oil in a small sauté pan. Add 1 small scallion bulb (about 1 TBSP) and let soften. While the scallions cook, clean and chop three mushrooms and 1 clove of garlic. Add them and let them cook until tender. Add salt and pepper and 1 tsp of caraway seed. Stir and allow the heat to infuse them before adding the juice of one fresh lemon. Then add 1 cup of chopped kale and 1/4 cup of cooked rice and stir. Cook about 3 minutes or so until the kale is tender but not mushy. I served with a pork loin chop and pickled parsnips. I am a Swede and have a culturally acquired love of caraway. If you don’t like it, you can substitute almost any aromatic and flavorful spice, from cardamom to nutmeg to cumin to wherever your imagination takes you. You just want to add another note to the flavors so that the earthy kale and mushrooms and the zesty lemon can play off something sharper. So this is about the easiest salad in the world. Basically, it’s a salad of round things. I peeled a carrot, a parsnip and cleaned 3 radishes. I sliced the carrot, about 1/3 of the parsnip and the radishes in thin slices on a mandoline. I also sliced about 2 TBSP of red onion on the mandoline. I put them all in a container with a tsp of olive oil and 1 tbsp of vinegar and a dash of cayenne. I covered and let it marinate for a day. When serving I added chopped fresh parsley. 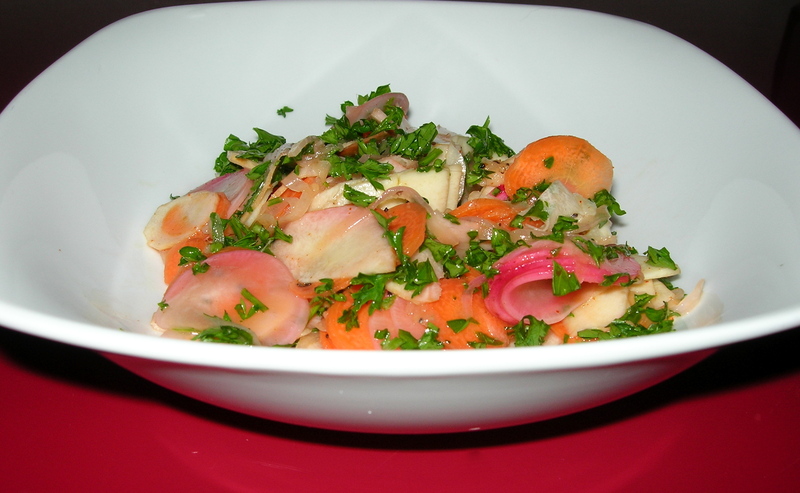 This is a very flavorful salad, hot with the cayenne, sweet from the carrots, earthy from the parsnips and with some bite in the radishes. The parsley adds just a touch of freshness. 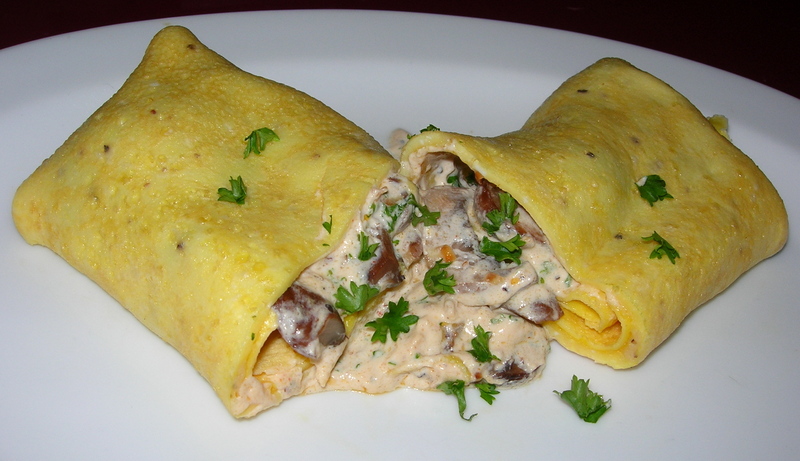 This may look a bit fancy with the multiple layers of thin omelette with mushroom sauce rolled up inside, but it only takes 15 minutes from fridge to feast. I started with the mushroom sauce. On medium heat, I melted 1/2 TBSP of butter and added 1 TBSP of diced scallions. I then washed and sliced 4 mushrooms and added them. Adding a bit of salt, pepper and about 1/2 tsp of paprika, I let them all sauté. Meanwhile, I heated a griddle to 250° F to cook my omelette. I use a lefse griddle because I have one, but any large, flat nonreactive surface will do. That means no cast iron griddles. It’s essential that the temperature be relatively low so the eggs cook through without browning or crisping since only one side touches the griddle. I whisked together 3 eggs, a large pinch of flour and just enough water to mix thoroughly. I also added salt and pepper and whisked it in. I took a dollop of butter and spread it over the surface of the griddle so all of the surface was covered and poured the omelette mixture in the middle and then tilted the griddle in different directions to make it spread out as thin as possible. I then left it to cook until it was done. Going back to the sauce, I added about 1 tsp of lemon juice and stirred that in. I chopped up some fresh parsley, about 2 TBSP, and added most, but not all, to the sauce. I kept a few pieces back to sprinkle on top at the end. I then added a heaping spoonful of sour cream to the sauce and mixed it in and removed the sauce from the heat. I waited until the omelette was cooked through before rolling it up. I have a lefse turner, but you can use a soft-edged spatula. Transferring to the plate, I unrolled it just a bit to add the sauce and rolled it back up, sprinkling just a bit of parsley on top for a bit of bright color. 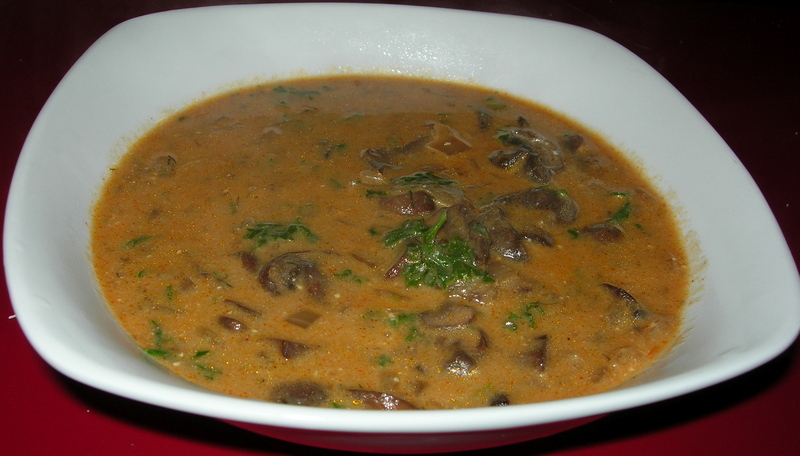 Frankly, sour cream, mushrooms, paprika and lemon is one of the most delicious flavor combinations known to man. You can’t go wrong with it and adding it to an omelette is just taking it up a notch. First I made the Tuscan Kale Salad. I used three leaves of kale, stripping the leaves off the ribs. I chopped up the kale, added 1 clove of garlic, and massaged with 1/2 TBSP of olive oil and a bit of salt. Adding the juice of 1/2 a lemon and then rubbed them altogether to soften the kale. I spread it on a plate leaving it empty in the center. Then I made the Chicken Apple Salad. I chopped up about 4 ounces of white chicken left over from some soup I made. I sliced a celery stalk lengthwise into 4 long strips and then chopped them into small pieces. I chopped about 2 TBSP of red onion and 1 apple and added to the salad. I added 1 tsp of celery seed and 1 tsp of mustard, salt and pepper and just enough mayo to dress the salad. I put the chicken salad in the middle of the kale salad. They work well together because they are so completely opposite in texture and flavor. 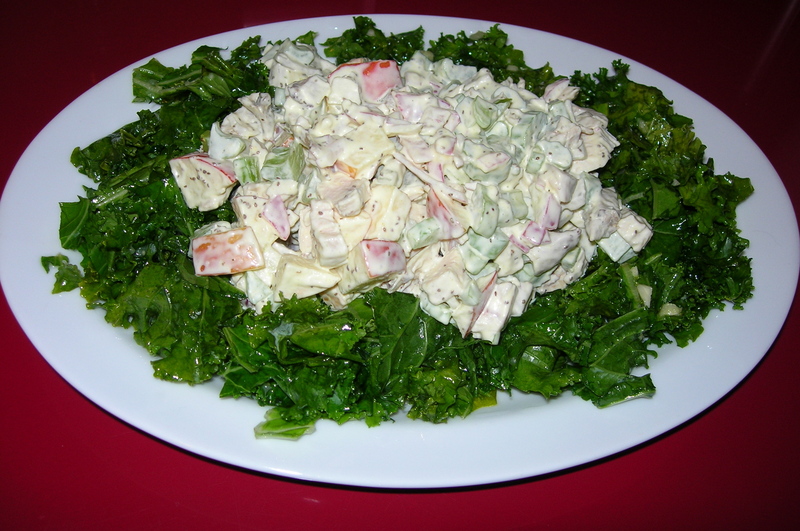 The chicken salad is slightly sweet and creamy while the kale salad is garlicky and juicy from the lemon. They contrast so well and taste delicious separate or together. This was a quick, tasty salad for lunch. First I cut up about a dozen brussels sprouts, about 1/4 cup of red onions and 1 Gala apple. I heated 1 TBSP of walnut oil in the skillet, added 1/2 tsp of cumin and 1 tsp of anise seed and let the oil heat. Then I added the sprouts, onions and apples all at once. Normally, you add onions first, but I didn’t want these onions to soften. I cooked on medium heat just until the brussels sprouts began to soften a bit. I added some salt and pepper and it was ready to serve. It made one serving and took less than 10 minutes from start to finish. 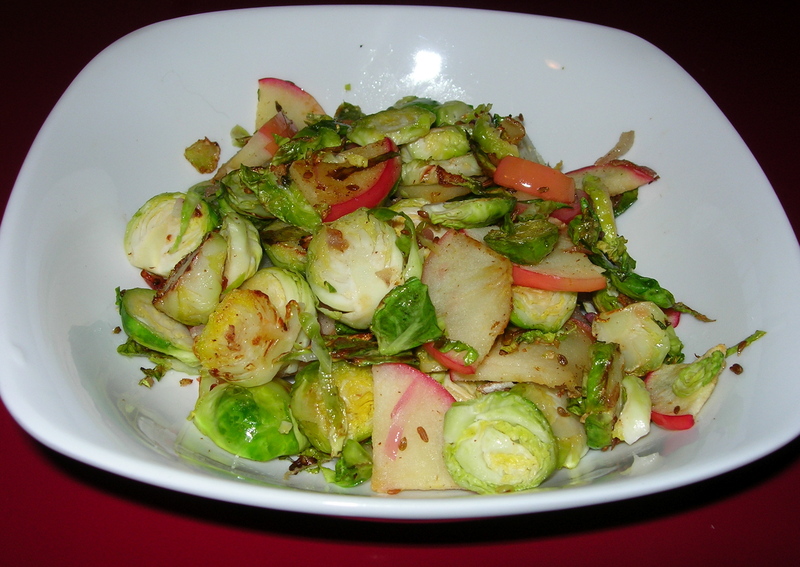 It has a nice blend of hearty and sweet with the sprouts and apple and the onion adds some great bite. The spices make it very flavorful and add depth.